One of them was a well-known army support volunteer and fighter. Two soldiers of the Joint Forces Operation (JFO) were killed in action and two more were wounded in action as a result of shelling by pro-Russian militants in Donbas on 2 April, the press service of the JFO HQ has said on Facebook. The two killed are well-known army support volunteer and fighter Yana Chervona and Junior Sergeant Oleksandr Milyutin, both from the Donbas-Ukraine battalion. "Bad news from the front line. Positions of the 54th detached mechanized brigade came under mortar fire. A direct bomb hit at a dug-out. Losses. Yana Chervona and Oleksandr Milyutin were killed today by an enemy bomb. The defenders of Ukraine. I knew Yana as a volunteer and a jolly person. It is difficult to believe," President Petro Poroshenko said on Facebook. 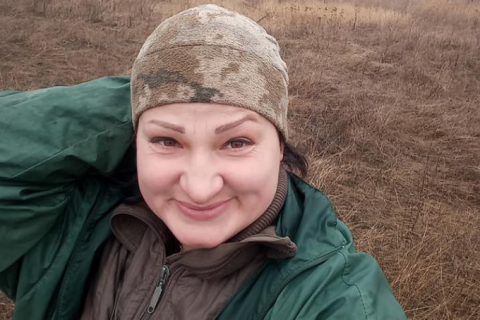 Yana Chervona (aka Vidma) took part in the Euromaidan protests in Kharkiv and provided support for the army as a volunteer. She then volunteered to join the special-purpose battalion Donbas-Ukraine as a machine gun operator. She is survived by her husband and two children.